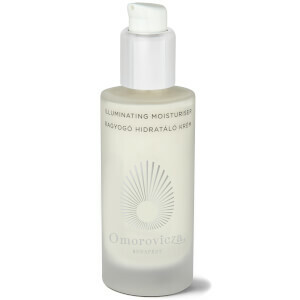 Treat your complexion to the Can't Live Without Set from Omorovicza; a family-owned, premium skincare label inspired by the healing, mineral-rich thermal waters of Hungary. Housed in a gift box. A sulphate-free formula that effectively eliminates impurities without over-drying or uncomfortable tightness. Harnessing the powers of Apple Pectin and White Lupin Extract, the delicately scented blue cleanser gently removes makeup, whilst delivering long-lasting hydration to reveal an energised, revitalised visage. The brand's patented Healing Concentrate™ delivery system leaves skin firmer, more supple and younger-looking. Infused with a host of vitamins, essential oils and natural ingredients sourced from around the world, the cream helps to restore suppleness and radiance back into dry, ageing skin. Rich in Apple Pectin and Plum Almond Oil, it delivers long-lasting hydration, whilst Ruby Crystal blurs the appearance of fine lines and wrinkles for a smoother, firmer-looking canvas. A Hydro Mineral Transference™ delivery system facilitates mineral absorption for maximum benefit within the skin. Moisturiser: Apply evenly to face and neck after cleansing. Moisturiser: Aqua (Hungarian Thermal Water), Glycerin, Cetearyl Ethylhexanoate, Simmondsia Chinensis (Jojoba) Seed Oil, Squalane, Caprylic/Capric Triglyceride, Cetearyl Olivate, Stearyl Heptanoate, Butyrospermum Parkii (Shea Butter), Corundum (Pro Ruby Crystal), Sorbitan Olivate, Cetearyl Alcohol, Saccharomyces (Hungarian Thermal Water) Ferment Extract, Mannitol, Phenoxyethanol, Malpighia Punicifolia (Acerola) Fruit Extract, Prunus Armeniaca (Apricot) Kernel Oil, Prunus Domestica Seed Extract, Pyrus Malus (Apple) Fruit Extract, Parfum (Fragrance), Tocopherol, Xanthan Gum, Ethylhexylglycerin, Linalool, Phospholipids, Yeast Extract, Chlorella Vulgaris/Lupinus Albus Protein Ferment, Pectin, Limonene, Geraniol.